Dan Tiley is ‘Chief’ at HealthTribe. He is a Holistic Health Coach with over 15 years’ experience in the health and fitness industry. Through experience and extensive study Dan has come to understand that in order to sustain a happy, healthy lifestyle a holistic approach to diet and lifestyle is critical. HealthTribe works on the basis that our bodies have the innate ability to repair and heal, providing we give them the right environment in which to do so. This means that by helping you to understand the key areas of your lifestyle, HealthTribe can guide you towards living a balanced life, and fulfilling your own personal goals, whatever they might be. 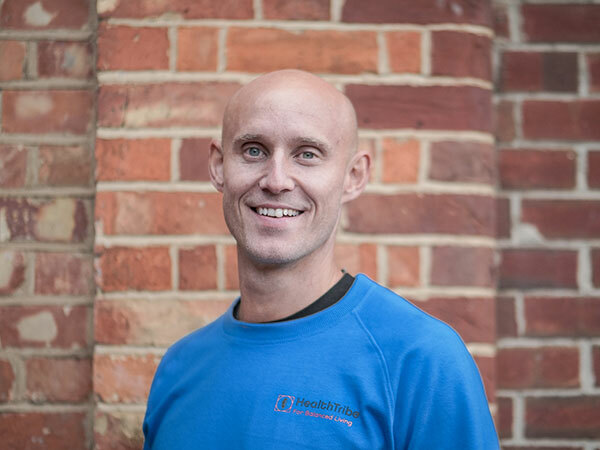 Passionate about learning and teaching, Dan is excited about the prospect of sharing his extensive knowledge to improve your health and wellbeing through HealthTribe. How does holistic health coaching work? Our holistic ethos means we take the time to understand you and your needs and goals. We believe in taking a detailed approach to your health and wellbeing, this leaves no stone unturned. The first step is to assess your health and wellbeing. We do this through comprehensive questionnaires, which can highlight any areas of imbalance. This will include an assessment of mental, emotional and physical stressors, any illnesses or history of injury, your current diet and nutrition, activity and movement levels and sleep patterns. We may advise further assessments if required. We carefully collate and evaluate all the information from your assessment and design a Four Doctor programme based around your needs. Your plan is therefore completely bespoke and designed to help you achieve balance and move you towards your goals. Dr Happiness – Gaining clarity on your core values and what creates happiness for you. Help with education, personal growth, mental and emotional management. Dr Quiet – A range of tools to help you incorporate optimal rest, introspection and spiritual time. Dr Diet – Providing tailored nutritional coaching. Help with overcoming digestive problems and tailoring your diet to your own needs. Dr Movement – A personalised work out and work in programme. Access to your programme online (video descriptions). We are happy to discuss your requirements over the phone initially to see if we are a good fit for you. The Four Doctors is a philosophy that we use at HealthTribe to help educate our clients about health and wellbeing. It is a synthesis and expansion of an ancient Greek philosophy popularised by Hippocrates and restructured by Paul Chek. Dr. Diet provides the foundation for wellbeing. Food and drink dramatically affect our energy levels and our biochemical reality, which in turn influences our emotional and our mental reality. Dr. Diet will provide guidance to make the right nutritional choices for your body. Dr. Happiness advises us that if we lead a life that doesn’t fit with our core values and doesn’t fulfil us, every facet of our life becomes a burden. So, the less your current lifestyle fits with your core values, the more you become stressed. The important guiding truth that this doctor offers is that happiness is an essential feature of genuine lasting health. Dr. Happiness shows you how to create and undertake the deep introspective study and intention to discover what makes you truly happy. Over the course of history, humans have become more and more sedentary. We no longer have to hunt and gather just to feed ourselves, and most of us aren’t working in the fields growing our own food either. Our jobs and careers require us to sit most of the day in front of computer screens, and the daily demands of our life often keep us from any kind of beneficial physical movement. Daily movement isn’t simply necessary for keeping a trim figure or decreasing the risk of heart disease. In fact, it’s necessary to get nutrients to and through our body, to move waste out of our bodies and to generate emotional stability and mental clarity. Dr Quiet is in charge of energy management and recovery. When you’re overly stressed and your fight or flight system is triggered repeatedly or for long periods of time, one of the first things to suffer is your sleep. Besides providing guidance toward good sleep, Dr. Quiet assists in obtaining the relaxation and the self-time people need to stay calm, focused and energised during the day. Dan specialises in holistic lifestyle coaching, nutrition, corrective exercise techniques and motivational speaking. Passionate about learning, Dan continues to broaden his knowledge in the field of Holistic Health through on-going professional development. Since graduating with a Sports Science degree in 2000, Dan has trained extensively with the CHEK Institute in California (Corrective, Holistic, Exercise, Kinesiology) and is qualified in many areas of Holistic Health, including Metabolic Typing, Mindfulness, CrossFit and Animal Flow. Sometimes clients need extra help to get them where they want to be. HealthTribe has a network of trusted like minded trusted and experienced specialists and is fortunate to be able to refer to clients to them when required. Some of the local therapies available are osteopathy, massage, acupuncture, energy and healing work.